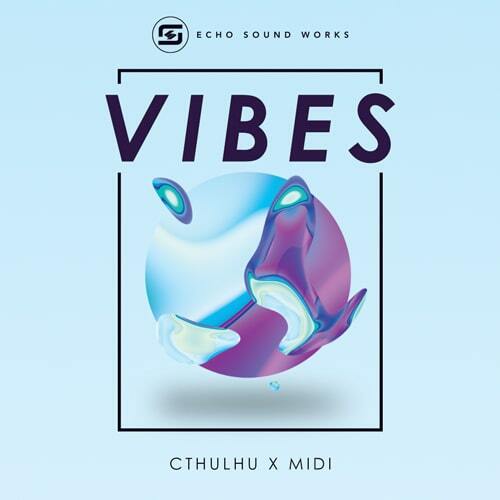 Echo Sound Works is excited to bring you our first Cthulhu and MIDI pack VIBES. VIBES is the ultimate tool kit for Future Bass and Future Pop productions. When we started making VIBES we had one goal. To create the most usable and inspiring Cthulhu & MIDI preset pack ever created so producers like you could could level up their production. The 95 Cthulhu presets, over 2000 chords, and 250 MIDI files came from 18 hand picked producers and the ESW team. Each producer sent us their 3 best, most unique chord progressions and we turned them into Cthulhu presets. Each preset feels like it’s very own song waiting to happen. The presets in Vibes are inspired by artists like RE3B, Illenium, San Holo, Grey, Zed, Marshmello, Martin Garrix, The Chainsmokers, and Lauv. Unlike other Cthulhu packs, each preset is meticulously laid out. You won’t spend a ton of time trying to piece together a chord progression. All chords are assigned to only white keys. This allows you to “find” the chord progression that was written for the preset, but you can also easily discover and create multiple unique progressions from a single Cthulhu patch. VIBES comes with 95 Cthulhu presets and 250 accompanying MIDI files made up of over 2000 chords. Even if you don’t have Cthulhu, you can still access all of these amazing chord progressions via the MIDI files. VIBES for Serum comes with 85 presets for Future Bass and Future Pop drops. Huge synth chords, supersaws, key patches and more. Get instant access to the source MIDI used to create the Cthulhu presets.